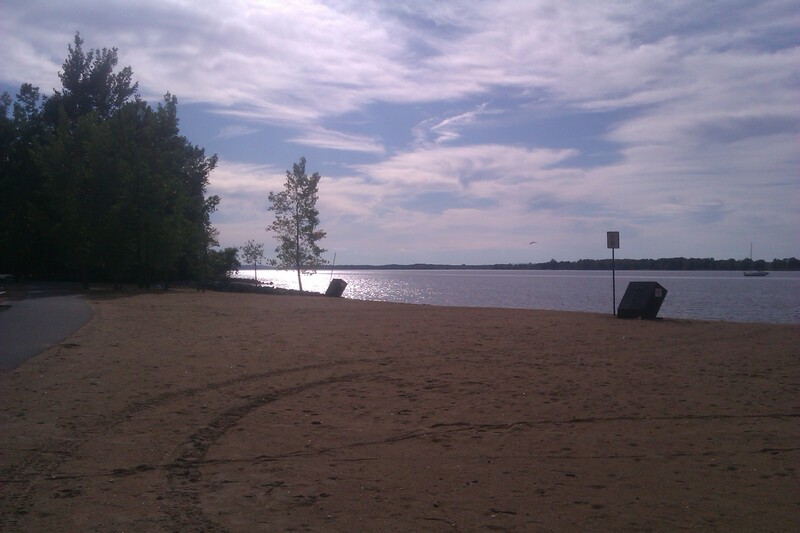 Petrie Island is a man made island and beach on the west side of Ottawa in the village of Orleans. This beach and island is actually quite a beautiful place to spend some time. There is lots of sandy beach to grab some rays and in the summer time many families come for picnics and the kids play volleyball. There are two beach areas, one facing onto the main Ottawa river towards the north. 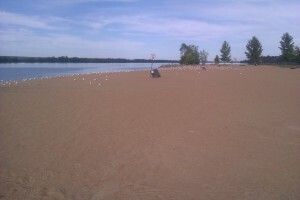 The other beach on Petrie Island faces east into a little lagoon that is created by the island. This tends to be a more secluded and quiet beach for many people to enjoy. Although this is a great area to come during the summer time, enjoy the suns rays and go for a swim there is a large problem that the city is trying to deal with. Whenever it rains there is a lot of pollution that is washed into the Ottawa river and then the city also has been known to dump raw sewage into the river as well. Consequently there are many days during the summer when it is recommended to not go on the water due to the bacterial problems with the water. There are also a lot of birds as the above picture shows which contribute to the problem. If you go to the beach be careful were you sit and watch what your kids put in their mouths. I took these pictures on a beautiful sunny day in early September. 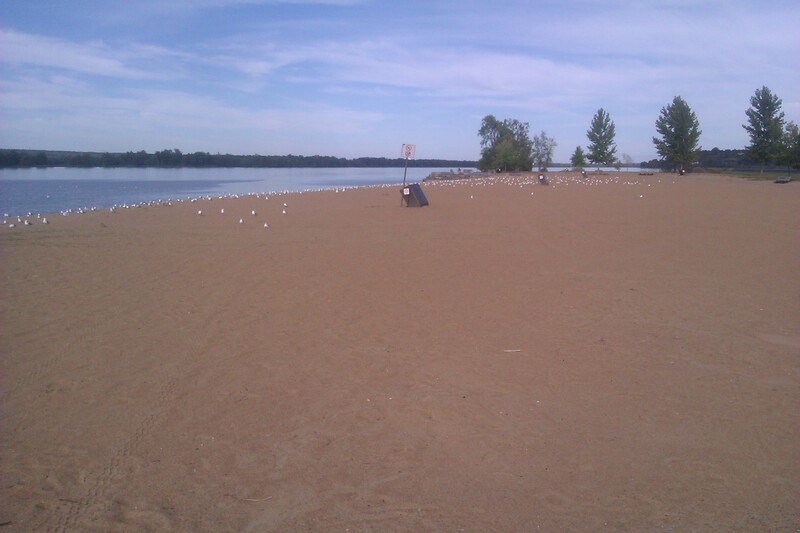 I found that the beach was popular with seagulls and the ever present Canada Geese. They can be seen on the picture on the right. This particular day there were only about 20 or so geese. 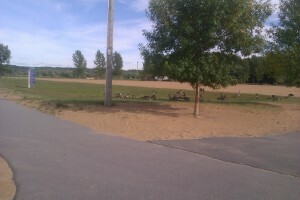 However I have been here when there are a lot more geese on the grass or in the water. They tend to leave a lot of droppings so you have to be careful were you walk. They do not seem to mind humans. Although watchful, generally will continue eating the grass or relaxing as you walk or bike by them. This is a problem that many areas in Canada have to deal with every year. It seems to be a growing problem for many areas. This last picture looks west towards Ottawa along the river. There are also shaded areas with a number of picnic tables among the trees. These are for people who want to be near the water and have a picnic with their families. There are also numerous walking trails through this area for hiking were you can observe the wild life. On the day I was there I saw many chipmunks, squirrels and rabbits along the trail. There are also turtles by the hundreds in the marsh area ( see next post on Petrie Island). They spend a lot of time sunning themselves on logs on the river bank. I counted 8 turtles on one log at one point. Petrie island is a great place to spend some time. Just be mindful of the pollution in the water and along the beach when you go. Maybe the city of Ottawa will be able to control the sewage that finds its way into the Ottawa river.